The dictionary definition of empathy is the capability to share, understand and be sensitive to another’s feelings, thoughts or attitudes. This is a necessary characteristic if mankind is going to be understanding and selfless in their interactions with others. Empathy helps us to see outside ourselves, to extend our compassion. There are three yogic philosophies which come into play when speaking of empathy. The first is Ahimsa. Ahimsa literally means non violence, not only physically but also not even in our deepest thoughts. This means not thinking, saying, or doing things which may harm others or ourselves. Nonviolence remains at the core of Yogic Ethics which I have heard referred to as a wheel. Ahimsa is the hub, or centre, with the other yamas, honesty, non-stealing, moderation and non-covetousness, forming the spokes of individual restraint. Practiced with whole-hearted effort, this wheel can turn humanity into a compassionate machine. to any living creature,either by thought, word or deed. Non-injury needs a harmless mind, mouth and hand. Ahimsa is not mere negative non-injuring. Truly this is empathy personified. As we learn to practise ahimsa we become sensitized to other’s pain and suffering. We begin to understand feelings and experiences different from our own and strive to approach life with loving kindness. The second yogic philosophy underlying empathy is Asteya (non-stealing). The idea of asteya is not of just material things but also of thoughts. If you are constantly dwelling on what others have that you don’t, or if you hoard your time, means, and talents you are building barriers to developing giving, loving relationships. Allowing the principal of abundance: that there is more then enough to spare in the world, will permit you to approach all people with empathy as you attempt to see the life through their eyes and experiences. Immediately you begin to see there is enough beauty for all people to be beautiful; there is enough talent that someone else’s performance does not distract from yours but adds to the collective creativity; there is enough love for you to engage emotionally with all people and still feel validated, supported, and desired. Truly there is enough in this world that we can see past our own experiences and be sensitive to the feelings and attitudes of others. The third philosophy is not a yama or restraint, but a niyama or observance. Saucha (cleanliness) teaches us to take care of our body and environment, including good hygiene, a clean home, and eating fresh and healthy food. This concept also extends to living a life based on a foundation of pure actions, words and thoughts. Keeping a clean body includes keeping a clean mind: a mind free of anger, lust, greed, and competition. All these drive away empathy and any good intentions we may have toward others. As we root around in our soul, cleaning out the debris of negativity, of possessiveness, of anger, of fear, we become clean and pure. We prepare ourselves to be more accepting of others and more prone to express patience and love in all our interactions. These Yogic Ethics truly support the development of empathy and can lead one to a greater understanding of another’s experiences, attitudes and feelings. There is also a wonderful program used in various schools throughout Canada, the USA and New Zealand to educate children about empathy in a hands-on interactive manner. It is the Roots of Empathy program. Roots of Empathy is a classroom based initiative that teaches children about empathy. 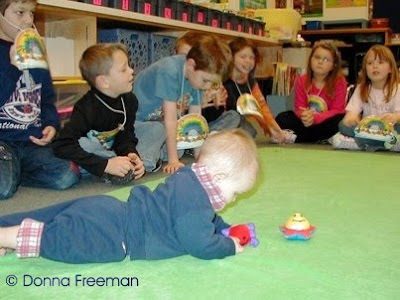 It works child to child as an infant with parent visit a classroom each month to demonstrate the loving bond the exists. Through guided observations of this loving relationship, children learn to identify and reflect on their own thoughts and feelings and those of others. I can personally attest to the effectiveness of the program as all of my children have been blessed to be involved either as students or babies. The bonds that are formed and the lessons learned last a lifetime, changing us all for the better. Empathy is an essential element to living well with others and being content with self. The world will be a better, more loving and accepting place as we strive to develop this trait in ourselves and our children.